Spend a few minutes reading about each of these familiar products, perhaps finding out a little more about how they were inspired, created and developed. The purpose of this section is to give you some encouragement to think creatively about a new idea or business development that has real value in the context of your own organisation. 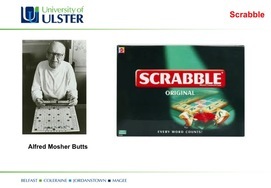 Alfred Mosher Butts invented Scrabble in 1931. He had been an architect but was unemployed during the Great Depression. He worked out the value of each letter by counting how often each letter of the alphabet appeared on a single page of the New York Times. Butts tried to get some toy and games manufacturers to take on his game, but without success. So he went into partnership with James Brunet, a retired civil servant. Production began in Brunet’s garage. By 1946 they were producing 200 sets by hand. Alfred Butts stayed in 1993, aged 93. By this time 100 million sets of Scrabble had been sold in a wide range of different languages around the world. In 1932 Forrest Mars, a young American, arrived in England. 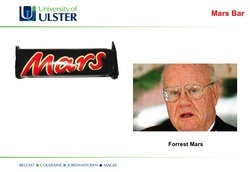 He had a recipe for a new chocolate bar: the Mars Bar. Before this chocolate had been sold in solid blocks. Forrest Mars introduced a bar in which layers of nougat and caramel were covered with milk chocolate. Production began in a small rented factory in Slough. In 1961 a second factory opened. Now the company has 2,300 employees and makes 3 million Mars Bars a day. The slogan “A Mars a day helps you work, rest and play” is one of the most famous in the history of advertising. New product development has helped the company to extend its range of sizes; and it produces Mars icecream, Mars milk, etc. This product is one of the great research and development accidents of all time. Spencer Silver was a research chemist at 3M. In the 1970s he was working on a new adhesive product which was supposed to be the strongest on the market. One early version was a glue which was very weak and did not stick to anything for very long. But it had its uses: the product when applied the paper was easy to separate and could be reused. 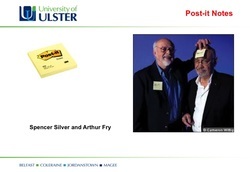 Arthur Friday was a colleague of Spencer’s. He sang in the choir it his local church and used the ‘useless’ glue on little slips of paper to mark hymns to be sung in the service. Other members of the choir expressed interest, they used the product and they told their family and friends; soon the word was spreading. Commercial production of Post-it Notes began in 1981. Now there are few offices in the world that do not have pads of Post-it Notes. He secured investment and the first buggy was sold in 1967. By the 1990s production had reached half a million a year, with steadily growing order books as export sales developed. The development of balloon tyres, with rubber made to a special formula, to give babies a smoother ride was another ‘first’ for Maclaren. Maclaren died in 1978, but his vision transformed baby transport all over the world. The revolutionary design liberated parents from the bulky pram and quickly became an object of desire for new parents. 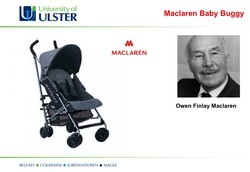 Maclaren Ltd today is a highly successful business, consistently winning design and safety awards for a wide range of products, all variations on the original theme. 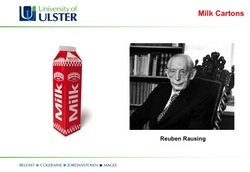 Reuben Rausing was a Swedish specialist in food packaging for dried products such as flour and sugar. He made his fortune from designing a four sided carton for liquids, using paper, aluminium and metal. Its benefits included its low cost, its lightness compared with glass and the ease with which it could be packed and stacked. Milk was the first product to appear in this way. Others now include juices, soup and wine. One night in 1934 Percy Shaw, a young road repairman from Halifax, had an idea as he was driving home. He realised he was finding this way by the reflected light on the tramlines. He set up Reflecting Roadstuds Ltd in 1935, investing his last few pounds in the company. 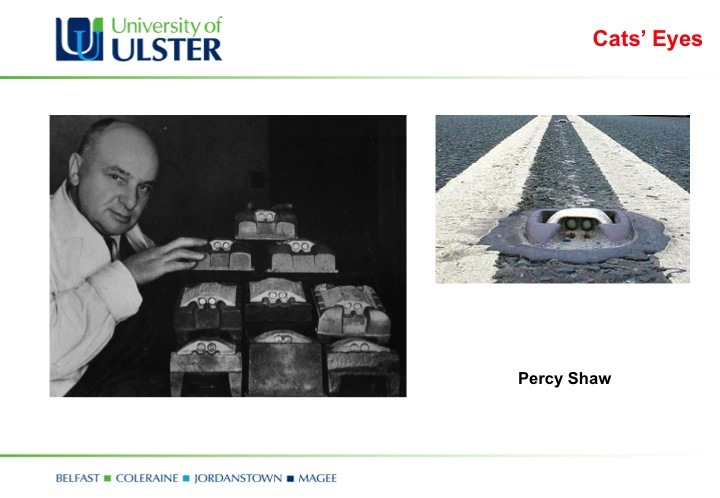 What was really clever about Shaw's invention was the rubber case in which cats eyes were placed. When a wheel went over them they were pressed into the rubber. This cleaned the glass lenses so that they needed no more maintenance. In World War II cats eyes enabled safe driving during blackouts; pilots in enemy aircraft could not see the reflected light. James Callaghan, who was the British Labour junior transport minister and later became Prime Minister, recognised the safety implications of the illuminated marbles and introduced them on British roads in 1947. Shaw made millions and received an OBE for his contribution to road safety. 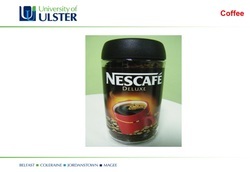 Nestle, the Swiss food company, launched Nescafe in 1938 after eight years of research and development. They use a freeze drying method which kept the oils which carried the taste and flavour. Consumers add water to restore the moisture extracted during the production process. After World War II the grew quickly in popularity. And in the 1950s it became fashionable, especially with young people who liked it stylish image and convenience. By the 1990s people in Britain were drinking 17,000,000 cups of instant coffee every day; this was 90% of all the coffee consumed. But competition was appearing on the High Street. In 1938 Achille Gaggia, an Italian designer and engineer, invented a machine which forced boiling water at high pressure through finely ground coffee. 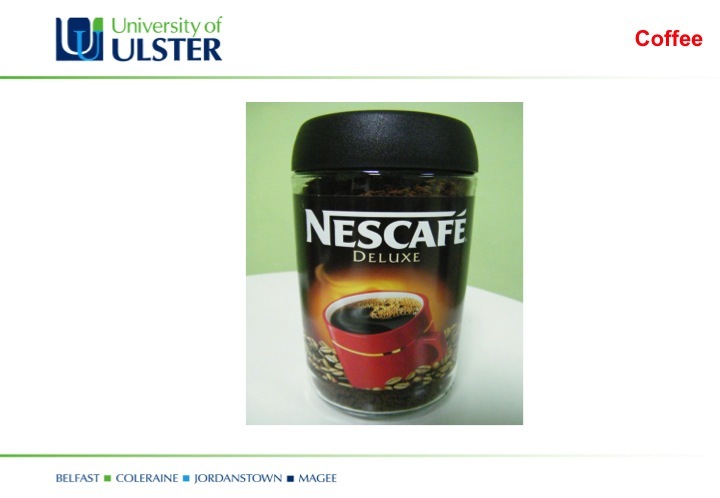 This produced a very strong liquid which could be served as it is (espresso) or mixed with milk in a variety of ways. Young people, and other people in a hurry, liked the convenience of espresso coffee bars. By the 1990s Starbucks, Coffee Republic and other chains had become prominent feature on many high streets round the world. Kleenex - Kimberly-Clark started by producing paper for newspapers in Wisconsin. 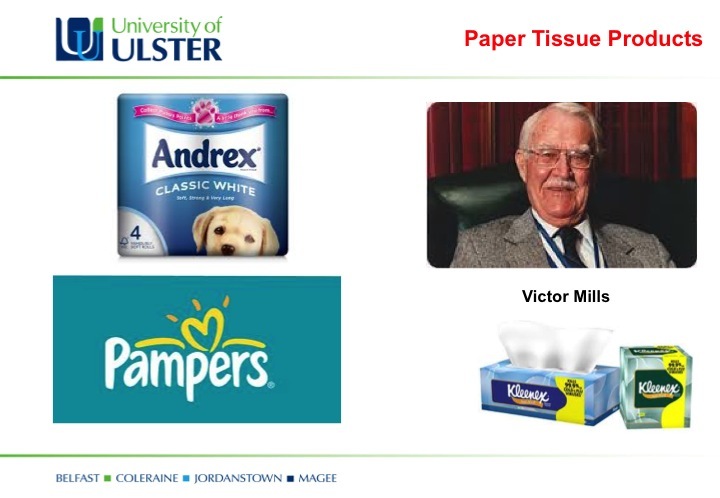 During World War I they produced an absorbent paper based product which was a substitute for cotton wool in hospitals. After the war they were able to modify their product, now named the next as the product which was used as paper-chips poker chips and is an effective way of removing lipstick and make up. Andrex - In Britain soft toilet paper was first manufactured at St Andrew’s Paper Mill in North London. The product, named Andrex, was advertised on television in 1955. In 1971 a mischievious puppy with a long, strong roll of soft toilet tissue first appeared in an Andrex commercial. Pampers – One evening with Vic Mills, a director of Procter & Gamble, had to look after his grandson. This involved changing the baby’s nappy. Vic was not very good at changing nappies and made a mess of this task. He spotted an opportunity for an alternative to traditional cotton nappies which had to be washed. At first consumers were not very interested in Pampers, especially because they were quite expensive. In the decades which followed their introduction in the 1950s these products have become more and more popular. Now 90% of babies in Britain wear disposable nappies; in France almost 100% of babies were them. New product development has produced products which are stronger, more absorbent and suited to the different needs of baby boys and baby girls. The big problem manufacturers face is ensuring that they can be disposed of in an environmentally friendly way. Raphael Espositio, and it Neapolitan baker, created the first modern pizza. It is based on an ancient Mediterranean cooking technique which goes back to the Romans and beyond. In 1889 in Umberto I, King of Italy, and his wife, Queen Margherita, were in Naples on holiday. They invented Raphael to the Palace kissed his specialities. Raphael prepared three kinds of pizzas: one with pork fat, cheese and basil; one with garlic, oil and tomatoes; and another with mozzarella, basil and tomatoes (in the colours of the Italian flag). The Queen liked the last kind of pizza so much that she sent a letter to the baker to thank him. 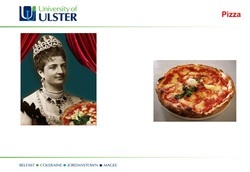 Rafael dedicated his speciality to the Queen and called it Pizza Margherita. This pizza set the standard by which today's pizza evolved and established Naples as the pizza capital of the world. 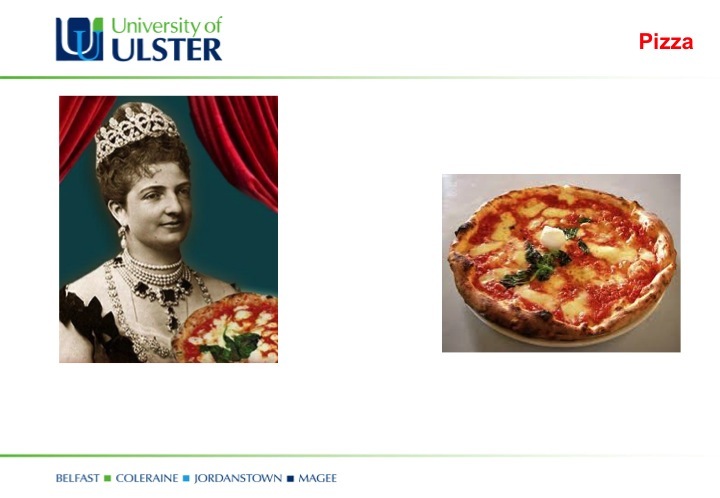 In the late 19th century pizza was sold in the streets in Naples at breakfast, lunch and dinner. It was cut from a large tray; it had been cooked in the oven and had a simple topping of mushrooms and anchovies. As pizza became more popular, stalls were set up with the dough was shaped to suit different customers. Various toppings were invented. The stall soon developed into the pizzeria and a place where people could eat, drink and talk. Italian immigrants who went to America took their recipes with them. And during World War II American soldiers who came to Europe developed a taste for pizza. Pizza is now second only to hamburgers as a convenience food. It is prepared and cooked at the local pizzeria, then eaten in the pizzeria or delivered to customers’ homes. Domino’s Pizzas is the largest pizza delivery company in the world, with 6,000 outlets in 60 countries. The first bar code on a product in Britain was used in a box of tea bags in 1978. Now bar codes appear on almost every retail item. The bar coding system was invented by the IBM and approved for use in 1973. It was first used in all kind of June 1970, on a packet of Wrigley's chewing gum. 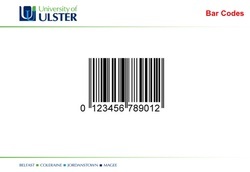 EPOS (electronic point-of-sale) machines can read the unique series of numbers on barcodes. 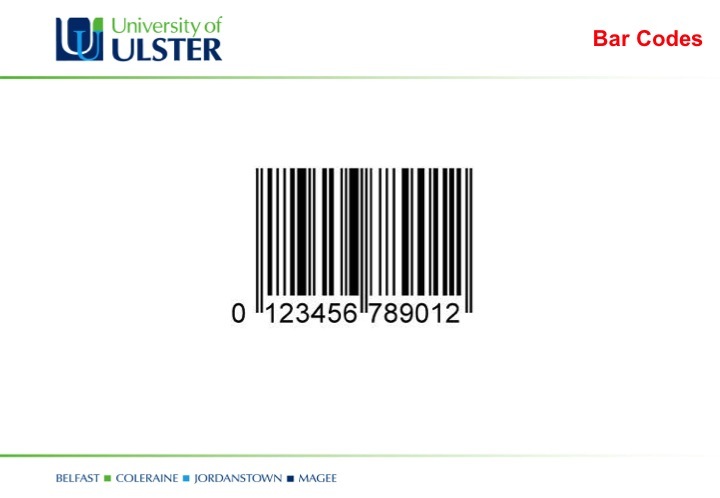 Bar codes have transformed the retail sector. They are simple to use and almost error proof. Each code uniquely identifies the product number, can identify of the manufacturer and can include information about size, description and stock levels. Managers can soon identify trends and customers references, so that faster and more accurate decisions about reordering can be made. And customers can get a fully itemised receipt for their purchases.